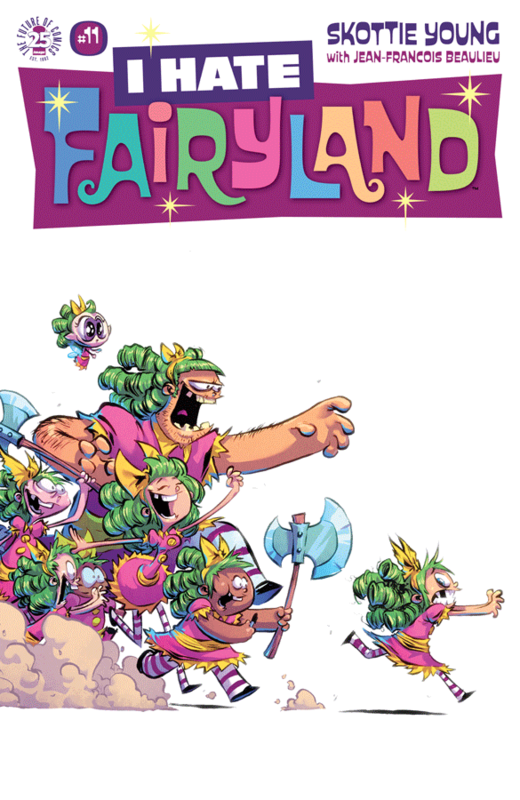 As I Hate Fairyland ventures into its third volume with issues #11, Gertrude sets forth into Dungeon Festexpocon. Yes, it’s time to explore the world of conventions in fairyland as Gert meets her idol, Gwag the Barbarian. But she also meets an unexpected surprise. Packing in the fun, Dungeon Festexpocon is full of surprises. The artwork provides no shortage of imagery with the wide variety of booths and con goers. On top of that, Gert doesn’t disappoint as she manages to wreck some violence at the con. While she does meet her idol, Gwag, it doesn’t go the way she had hoped, but it does lead to something else: a groupie. Yes, Gert learns she has fans, and one of them wants to be just like her. This milestone marks a major turning point in the issue, as they leave the con and head out into the wilds for some lessons. From drinking to killing, Gert teaches her protege to be just like her. Perhaps a little too much like her. In fact, in the end, Gert actually decides to change her life and become a good person. Yeah, we’ll see how long that lasts, but it could be an interesting change of pace for the story. As is, this issue was full of fun, action and laughs, as well as murder and mayhem. With each page adorned with wonderful art, it scores another high note with a five out of five metal bikinis.